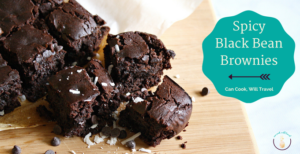 Yep, you read that right – Healthy Brownies! I’m a total chocaholic, so creating a dessert that wasn’t totally guilty makes me so happy. And that’s exactly what is happening with this recipe, and I’m pretty excited to share it with you. So I’ve been playing around testing this recipe the past week, and wow are they good. I mean not only are they insanely easy to make, but they’re also a great little snack or bit of sweetness for dessert. I’ve heard about black bean brownies for a while, and that’s what these guys are. They’re flourless, gluten and dairy free, and you won’t believe any of that after one bite. 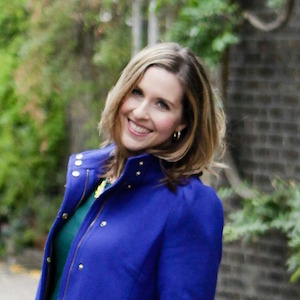 I’ve been loving following Laura Lea Goldberg and here site LL Balanced, so I used her recipe as an inspiration for mine. Here’s the thing, if you love chocolate, then you’ll love this recipe. And if you have people who aren’t big sweet fans or into chocolate like I am, odds are good they’ll still like these healthy brownies. Case in point is my boyfriend who really doesn’t like sweets, but we can’t judge, can we?! However with these little guys in front of him, trust me that he still enjoyed them. And they are pretty rich and chocolate-y, so one little piece is enough to satisfy you. They’ve lasted quite a while around me, which says a lot about how filling they are. Back to making this recipe, because as I mentioned it’s very fast and easy. Just grab a blender or food processor, because it all gets blended up. You’ll combine (drained and rinsed) black beans, maple syrup, honey, almond butter, cocoa powder, salt, baking soda, vanilla, cinnamon, and cayenne and blend until it’s all mixed together. Then stir in some chocolate chips, and I use the dairy free kind from Enjoy Life that I talk about ALL the time it seems. 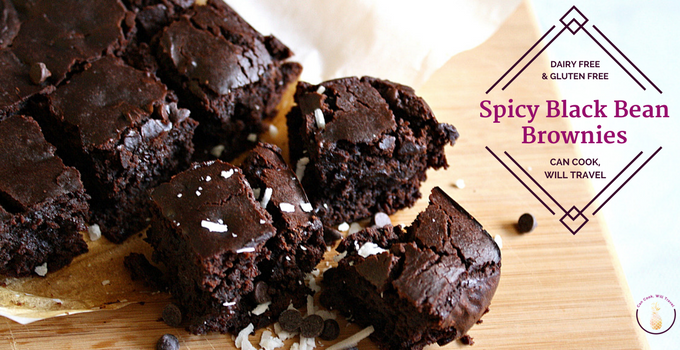 One thing I did was add some spice to these healthy brownies, so you can certainly skip that if you want. With the addition of some cinnamon and cayenne to the brownies, the flavors amp up a bit with more dimension. 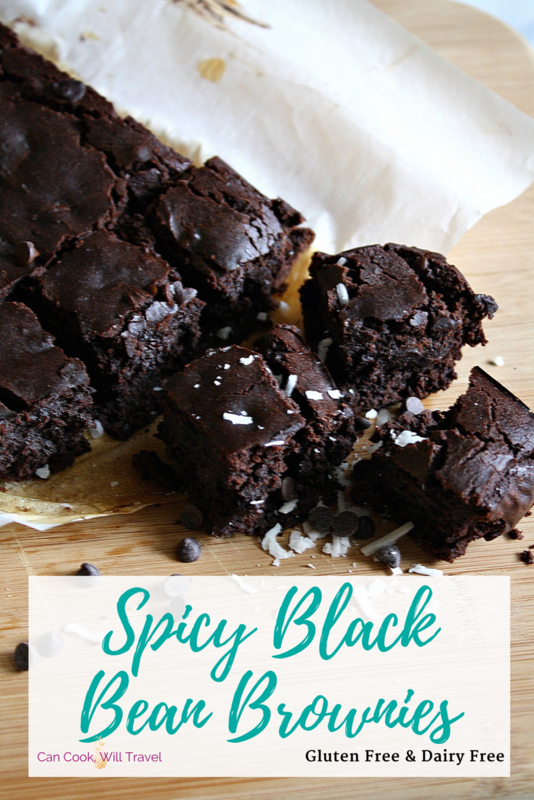 Now I know the thought of cayenne might freak you out, but I was inspired by one of my favorite chocolate bars – dark chocolate infused with chili. Oh hell yes! Adding the cayenne simply gives the brownies a bit of warmth and interest, so don’t be afraid. And then bake the brownies in a lined loaf pan for 50-55 minutes or until they’re baked through. My oven is pretty good but usually takes a bit longer, so I baked mine about 52 minutes, and you’ll find that a toothpick won’t come out totally clean due to the chocolate chips. Then let them cool in the loaf pan for at least an hour so they hold together better. Slice them up and dig in. They’re ooey, gooey, rich, chocolate-y, and the perfect sweet treat! Now keep in mind with these healthy brownies, it’s not like they’re really good for you, because there’s still plenty of sugar. But it’s all from the maple syrup, honey, and then chocolate chips, so it’s not horrible depending upon what kind of chips you use. But you do get some fiber and protein, so that’s a plus! The whole idea is that they’re a great way to satisfy your sweet cravings without going overboard. And I like to cut them into small pieces, so that I don’t overindulge. 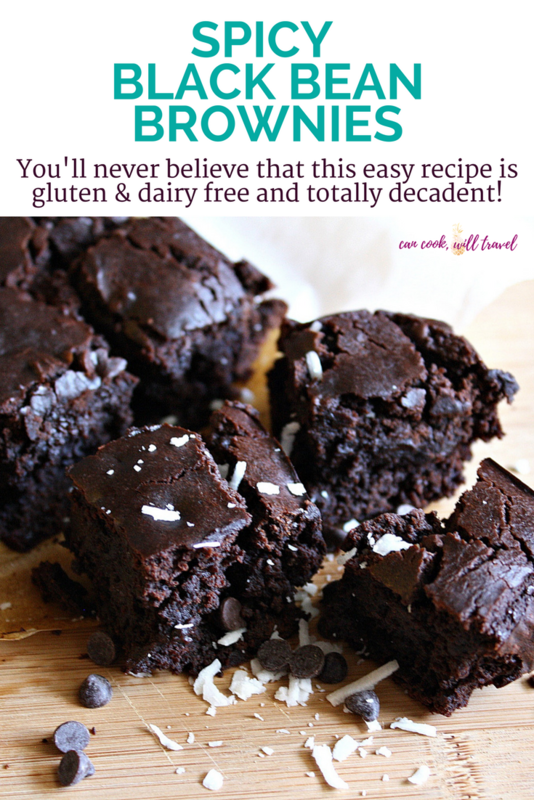 So I highly recommend checking out this healthy brownies recipe for yourself. Click that link for the step by step instructions and recipe, because it’s the right thing to do for your sweet tooth. Happy baking! Two years ago: Broiled Grapefruit Heats Up Breakfast! Four years ago: Well Hello Cheesy Quinoa and Broccoli Patties!